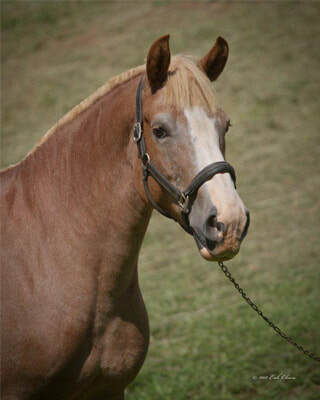 CHESSY’S STORY: Chessy is one of the original Goudelock family horses who helped them found Eden Farms. She was born to them soon after they bought her mother, Ellie. She is Maggie’s sister, and is Amy Goudelock’s favorite horse. Here at Eden Farms, Chessy does a lot of birthday parties, camps, and trail rides. Chessy and Maggie are the main EAL (Equine Assisted Learning) horses. They seem to have the ability to connect with kids and give counselors a lot to work with. Chessy is famous for drooling at the most inopportune moments possible. Still, she is eager to be “loved on” and will even leave her food to come to her stall window to say hello! She is known to be calm on the ground, sweet and faithful. She is very good at falling asleep in the cross ties when being groomed. Since 2005, she has patiently given rides to and received hugs from thousands of children. What a life! FLASHY’S STORY: Thanks to the generosity of the Klapperich family, Flashy has been a long term free lease horse since 2011. She is a favorite of many due to her calm and patient demeanor when being ridden. Flashy works well with many kinds of riders including therapeutic riders, English lesson students, summer campers, and field trips. She also really enjoys trail rides, especially when she can go with a friend! In the hot weather, she loves getting long baths. Some of her distinguishing marks include a star, strip and snip on her face which makes it easy to recognize her. She loves being brushed, massaged and getting lots of love!!! 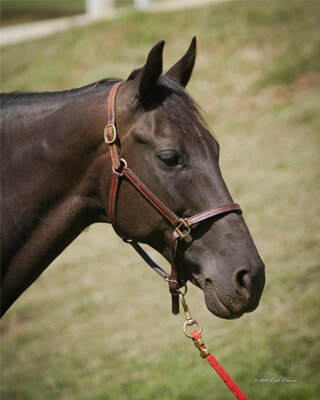 HANNAH’S STORY: Hannah was donated to Happy Hooves with another horse as a package deal. It was thought at the time that Hannah would be more of a companion horse and less useful than the other horses. The opposite happened. Since 2002, Hannah has been an essential part of the Eden Farms and Happy Hooves programs. Hannah is known for being a little slow at the walk and trot. That being said, she is “bomb-proof” and is a trusted partner for the beginner riding lessons and Happy Hooves therapy sessions. Most children learn to canter on Hannah because she is smooth and reliable. When Hannah is taken off-site for horse shows, she picks up her pace, turns on her “A-game” and makes her rider proud! Much like a beloved teacher or childhood friend, everyone at the barn has a special place in their hearts for Hannah! Fun Fact: Hannah has been featured on the cover of Upstate Parent Magazine! REBECCA’S STORY: This sweet Belgian mare has been with Eden Farms since it opened in 2001 and weighs almost 1600 pounds! Rebecca’s parents are Martha and Jerry, two draft horses Amy Goudelock bought in Charleston. She was trained to pull the wagon through basic reining with a large tire but did not progress further because she began doing more lessons here at Eden Farms. She now does both able-bodied and therapy lessons, as well as trail rides. 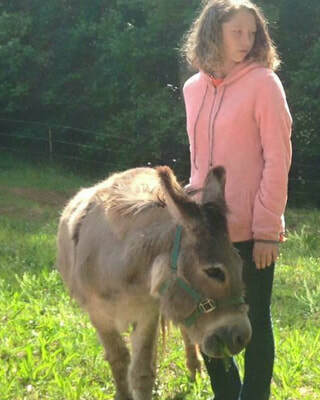 Rebecca is the Alpha Mare at Eden Farms and only goes out with her one true love: Zacchaeus, a 400lb miniature Sicilian donkey! 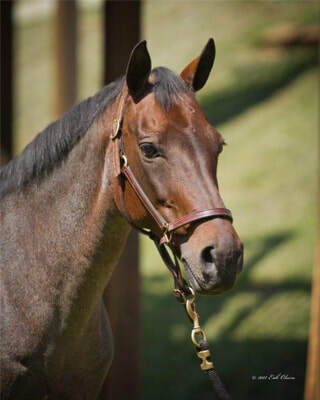 She is the favorite horse and namesake of Barn Manager Becky Sweeney, and was trained onsite by Becky and her sister Jenny. She continues to be conditioned and schooled by Eden Farms instructors, and has turned into a valuable therapy, trail, endurance, vaulting, jumper and Dressage horse! FUN FACT: Rose will eat anything – one time she even ate a chicken nugget! 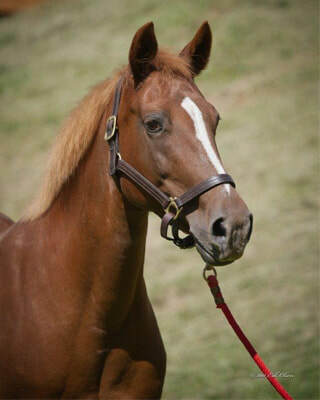 Eden Farms purchased Rose as school pony in 2003. In June 2006, Anne Mason, a 9-year-old lesson student, began leasing Rose from the barn. In the fall of 2007 the only thing Anne wanted for Christmas was Rose, and lo and behold, on Christmas Day she found Rose’s stall all wrapped up in Christmas paper with a note that she was now Anne’s! In 2008 and 2009, Anne and Rose showed in the Short Stirrup divisions. It’s hard to make riding look easy on a pony that loves to go fast! In September of 2009, Anne and Rose decided to enter the Hopeful Jumper division (jumpers are fast and timed), and they discovered what Rose was born to do. Anne changed her show name from “Rachael Rose” to “Faster Than a Speeding Bullet,” and she definitely was! In 2010, Anne and Rose were year-end champions in both the Hopeful (2’-6”) and Progressive (2’-9”) Jumper Divisions for the Blue Ridge Hunter Jumper Association and for Progressive Show Jumping. No one could believe she was 19-years-old and had been a school pony! But now Anne needed a bigger horse, so she donated Rose back to the barn where she is a school pony again. Rose loves doing therapy lessons and somehow knows just what her rider needs – whether fast or slow. 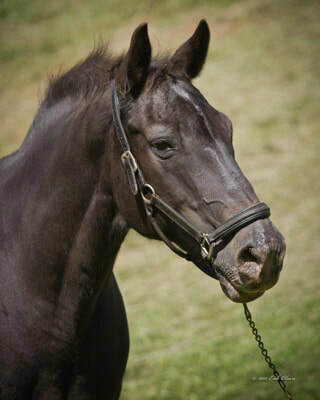 MAGGIE'S STORY: Maggie is one of the original Goudelock family horses who helped them found Eden Farms. Her father was a paint Tennessee Walking Horse, and the family hoped that she would be, too. Instead, she is black with a beautiful long black mane. Many of the children affectionately call her “Black Beauty” or “Beautiful Maggie.” Can’t complain about that, right? Maggie was born with a club foot. The Goudelocks had it repaired with surgery. Over the years, she has developed scar tissue on her front left leg where the surgery was done. This has been an amazing connection between her and Happy Hooves riders who have also had a club foot or other leg issues! 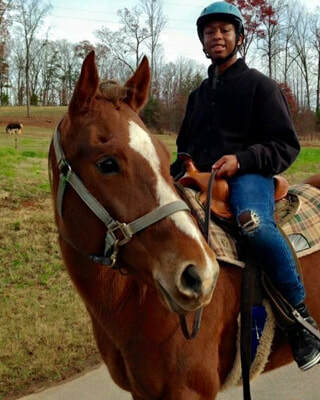 Because she’s a Tennessee Walking Horse, Maggie has a much faster pace and is a joy to ride on our 160 acres of trails! She is mostly used for trail rides, summer camps, and Equine Assisted Learning. Maggie is Chessy’s younger sister. Have you ever wondered why there’s an extra clip on Maggie’s outside stall door? Maggie can skillfully use her lips to unlock it and get out! When she did sneak out of her stall in the past, she would just stand right in front of barn and graze! TONKA'S STORY: Tonka was the beloved horse of Helen Corontzes who died tragically in an automobile accident in 2006. To honor Helen’s memory, her friends and family founded Helen’s Hugs – a non-profit organization that supports the Happy Hooves Therapeutic Riding Program located at Eden Farms. Once on the eventing show circuit with Helen, Tonka first worked at a camp in North Carolina for several years. In November 2010 Helen’s family brought him to live at Eden Farms, bringing him “home” to Happy Hooves. How appropriate that Helen’s gentle giant could now be there to help the very children and adults that her foundation supports! Tonka now spends his days ministering to the students of Eden Farms and Happy Hooves. He touches the lives and hearts of everyone he meets. 1. The Welcoming Committee Chairman. When new horses come to the barn, they are kept in quarantine for several weeks before being allowed to join the other horses in the main barn. Because horses are such social animals, this can be a stressful time. They could get lonely and might need a friend. Zacchaeus puts the new horses at ease by providing this much needed companionship. Many of the horses in the barn have become quite attached to him. 2. Best Supporting Actor in the Live Nativity at Christmastime. Don’t miss his performance at our annual family friendly fundraiser for Happy Hooves: Christmas at the Barn! 3. Birthday Party Donkey. Zach loves to meet the special birthday party boy or girl and all their friends! He is just the right size and a popular stop on our barn tour. Since 2001, he stands patiently to be petted. When you walk away, he may give you his famous “bray” asking you to come back and give him more attention!